Spring is sprung the grass is riz, I wonder where the perfume is? 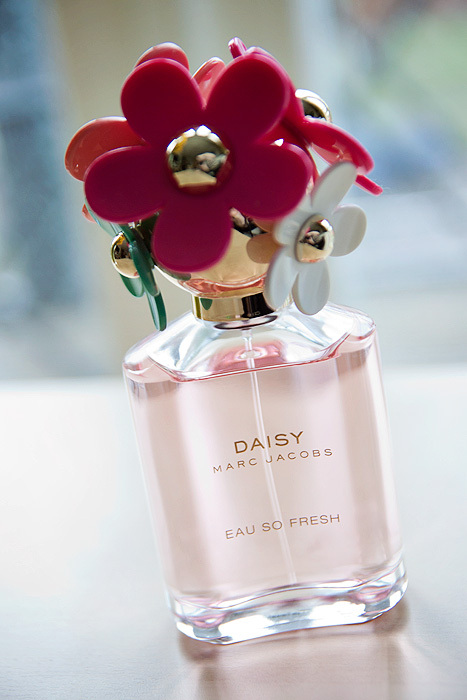 Well, here it be… in the form of the limited edition Daisy Eau So Fresh Marc Jacobs Delight Edition. The juicier, fruitier, and altogether sweeter incarnation of the original Marc Jacobs Daisy Eau So Fresh which was released back in 2011. And what a pretty perfume she is, resplendent in pink, gold, and green. Scent-wise, she’s not my cup of tea… by now, you’ll possibly know that I like my fragrances to be a little broodier, a little more… pissed off. 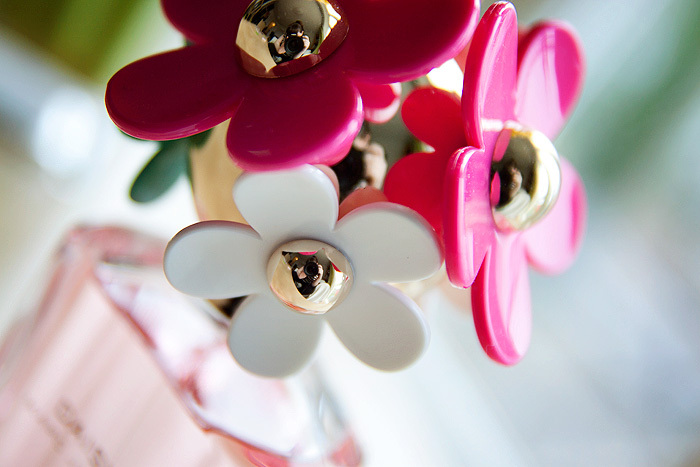 Daisy Eau So Fresh Delight Edition is about as un-pissed off as a perfume can get. She’s up with the lark, singing “Good Morning” like Judy Garland on acid before you’ve even had time to press the snooze button. With top notes that include: blood orange, pink pepper, and white tea; you know that you’ll receive a full-force, pink-pepper fruit bowl in your face from the off. It’s also lacking the resolute bunch of green notes that refused to lay down and die in the original version, giving the fruitiness an added extra. One that will be either welcomed, or shooed away depending on your tastes. From here on in, the fruitiness – though never completely subsiding – steps back a little to make way for a floral heart of tiare tahiti, violet, and… err, oh, more fruit in the form of raspberry. 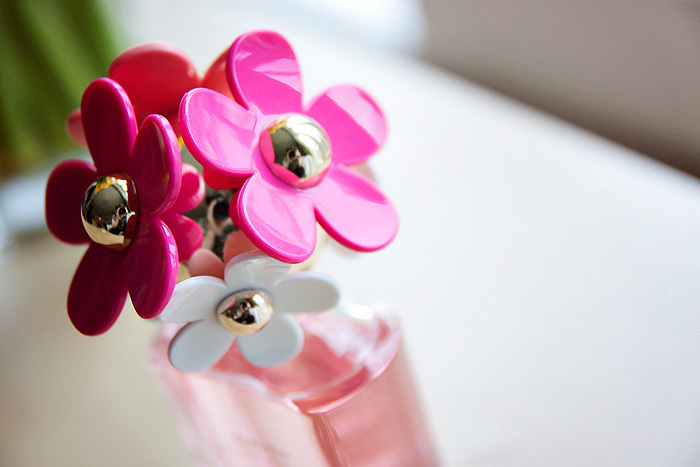 It’s a pleasant scent that evokes feelings of an eternally hopeful, warm Spring day spent enjoying the sunshine. Heck, the pesky fruit even manages to sneak into the muskier base notes, as apricot skin puts in an appearance… prolonging the good-natured agony. As a whole, Daisy Eau So Fresh Delight Edition is clean and a little powdery, tender and flirty in a youthful, innocent way. You’ll probably either fall in love with her, or want to club her with a grumpy stick, this may depend on your age and the current state of your love-life. Go sniff her out and decide for yourselves! If you’re a fan of the Marc Jacobs Daisy franchise, you’ll be interested to hear that there is also a while-stocks-last Delight Edition of the original Marc Jacobs Daisy which promises a more vibrant expression of the iconic Daisy signature. I actually prefer it!